Peri-peri is Portuguese in origin. It usually consists of crushed chillies, onion, citrus zest and juice, paprika, basil, oregano and tarragon, but I like to add a pinch of ground cumin and ground coriander too. Begin by preparing the spicy rub. Place the chopped garlic in a mixing bowl. Add 1 tablespoon of the paprika and all the remaining spices and mix to combine. Add the lemon zest and juice and 1 tablespoon of the olive oil and mix together again, then rub all over the pork chops. Leave to marinate for 20 minutes. Place the sweet potato wedges on a baking tray. Drizzle with the remaining 2 tablespoons of olive oil and season with the remaining tablespoon of paprika and some salt and pepper. Roast in the oven for 30 minutes, until cooked through and golden. Place the pork chops on a roasting tray and transfer to the oven. Roast for 10 minutes, until nearly cooked through. Add the chicken stock and return to the oven for a further 10 minutes, basting regularly. Serve immediately with the sweet potato wedges. 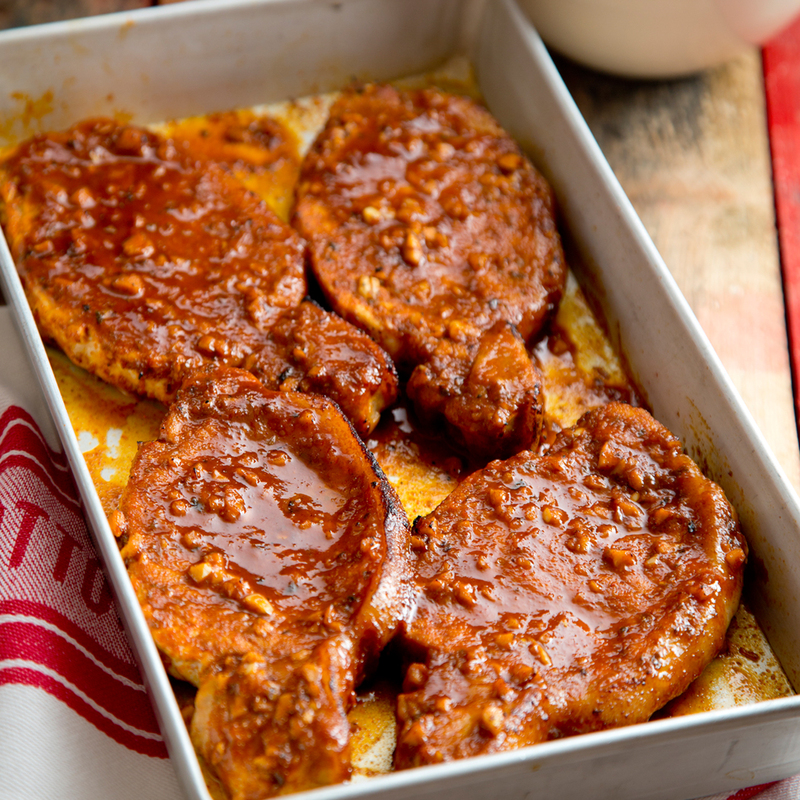 Tip: If you'd like to concentrate the cooking juices to serve as a sauce, transfer them to a small pot once the pork chops come out of the oven and boil until the liquid has reduced.